A diverse group of ex-judges, diplomats and former military lawyers is urging the US Supreme Court to intervene on behalf of hundreds of men being held without trial by the government. 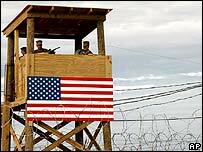 They hope the top court will agree to review the detention of suspected al-Qaeda and Taleban members in the US military camp at Guantanamo Bay in Cuba. US officials insist there are reasons for holding the alleged fighters and say they will get a fair legal hearing in due course. But opponents say it is already nearly two years since most of the detainees were captured and they should be afforded more rights now. John Gibbons, a former appeals court judge, said justice was being "totally denied" to the detainees in Guantanamo. "They don't have access to lawyers; they have had no hearings; they are just in limbo. That's as clear an example of justice denied as you can find," he said. A key issue is that the detainees are foreign citizens being held on foreign soil and as such may not come under the jurisdiction of the civil courts. Mr Gibbons said he found it "repugnant" that the administration could order the imprisonment of people possibly beyond the reach of law, especially as he said the US clearly ruled over Guantanamo Bay, even if it was technically part of Cuba. He said he hoped the Supreme Court would be persuaded to "restore the rule of law" with the filing of the legal papers by the seven groups supporting two cases brought concerning 16 detainees, including two Britons - Shafiq Rasul and Asif Iqbal. There is no compulsion for the US Supreme Court to review the cases, but Mr Gibbons said he was optimistic that the support needed from four of the nine justices would be forthcoming. Don Guter, the US navy's judge advocate general until last year, said extreme measures were necessary after the 11 September 2001 attacks on the United States. 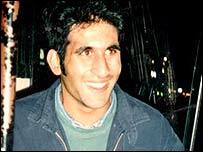 But Mr Guter, who was inside the Pentagon when it was deliberately hit by a hijacked plane that day, said it was not acceptable simply to hold suspected al-Qaeda or Taleban members until the US' war on terror was over. Such a victory might never come he said, and even if there was no public outcry about the treatment of Guantanamo detainees the US should permit them various rights, not least to stop possible retributions. The argument filed to the Supreme Court by Mr Guter and other former military lawyers said: "The lives of American military forces may well be endangered by the United States' failure to grant foreign prisoners in its custody the same rights that the United States insists be accorded to American prisoners held by foreigners." That view was backed by ex-prisoners-of-war, some of whom told the Supreme Court they believed they owed their lives to the fact that their captors abided by the Geneva Conventions designed to protect captured soldiers. 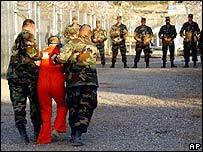 William Rogers, a former undersecretary of state, said there was concern that the situation in Guantanamo would take the US from the moral high ground where it could be a role model to other nations to a much lower position. He and 18 former US diplomats, including 11 ambassadors, filed their own papers which said: "The perception of this case abroad - that the power of the United States can be exercised outside the law and even, it is presumed , in conflict with the law - will diminish our stature in the wider world."